Hello friends. I have not forgotten about you. I am working on a post on the hormones responsible for weight gain. In the meantime, I wanted to post something about being stuck in a rut. What do you do when the last 10 pounds won’t budge? What do you do when you stop seeing results? What do you do when you’d rather eat ice cream than workout? Here are some suggestions (Always check with your doctor before changing your routine or exercise program). 1. Change up your workouts. if all you do is run, try spinning or a dance class or boxing, or a new routine for a few weeks. Check out a program that switches things up every 4-6 weeks. 2. Change up your diet. I like the phrase: Eat breakfast like a king, lunch like a prince, and dinner like a pauper. Try to make the last meal of the day one with less or little carbs. 3. Cut back on or eliminate sugar, salt, processed foods, bread (white and wheat), and eating late. If you drink alcohol, it will also pack on the pounds. Eat whole foods and drink plenty of water. 4. Make sure you are challenging yourself. Sometimes we are half doing a workout and it shows or we’ve been doing the same workout for so long we are no longer challenged. 5. Make sure you’re eating enough of the right foods. Proper nutrition is important for building muscle, maintaining lean muscle, and having the energy to workout. Are you eating enough protein, vegetables, fiber, fruits? Are you eating enough? Starvation diets lead to a plateau becasue our metabolism slows down to compensate for a lack of food. 6. Count those calories, you may be eating more than you think! 7. Are you stressed out? Are you sleeping enough? We will talk about hormones the next post. Cortisol (stress hormone) tells your body to store fat! If you are stressed or over working your body (long cardio workouts-2 hours or more), you could be producing cortisol which tells your body to store fat. So, throw in a rest day. Have some R & R. Find ways to relax. One great way is to unplug from the internet. Social media, smart phones, and constant communication leads to stress. We all need a break every so often. If you aren’t sleeping enough 6.5-8 hours per night, you are more apt to gain or be unable to lose weight. What to do when you don’t want to workout! I am doing a Biggest Loser Competition with my coworkers. Some people are so excited and they keep losing. Some people seeing the major results of others have lost motivation. The goal of wellness is to make a lifestyle changes. I go through phases where I do not want to workout. I would rather lay on my couch and sleep. I don’t love exercise. So here are some things I recommend that help me out. Try something new. I recently started doing Zumba. I have a dance background so it’s great. I love it. I get up early and start the day with Zumba. Weight training is reserved for after work. By doing something that I love, I am more apt to stick with it. 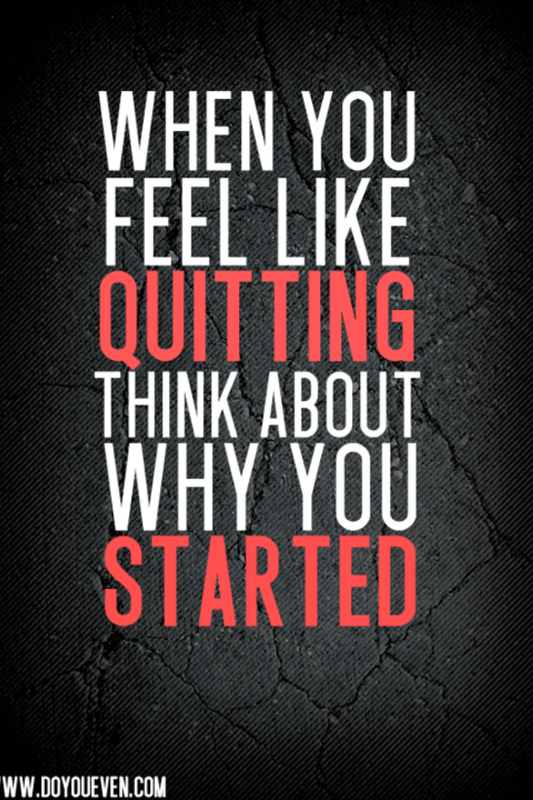 Think about why you started. I posted on this a few weeks ago. Post an old photo up if you have to. And recall it’s harder to take the weight off than it is to lose it. Our bodies would rather cling than lose any day. Instead of planning 1-2 hour workouts 4 days a week, try working out for 1/2 hour every day! I can commit to 1/2 hour. Lastly, believe in yourself. You can do anything you set your mind to. I recently read about a woman who’s a competitive body builder and she’s 75. She didn’t start training until she was 71. She’s the oldest female competitive body builder. How awesome is that? She runs a 10K daily and teaches exercise classes! Previous Post What To Do When You Fall Off The Wagon! BOOM! True WISDOM. Thanks for sharing. Thanks for stopping by! Wishing you well on your wellness journey. Great for that little motivational bump we all need every now and then!